Friends – you know that I prefer to post my own, original recipes. But THESE Chocolate Chip Cookies are actually the BEST most PERFECT Chocolate Chip Cookies that I have EVER tasted! And I simply had to share the recipe with you all. I know, it is unbelievable! Where did they come from? Whose recipe are they? Why are they so delicious? What makes them different? Don’t worry, I will answer all these important questions! My good friend Leah made these cookies first and was SO impressed that I forced her to share the recipe with me! 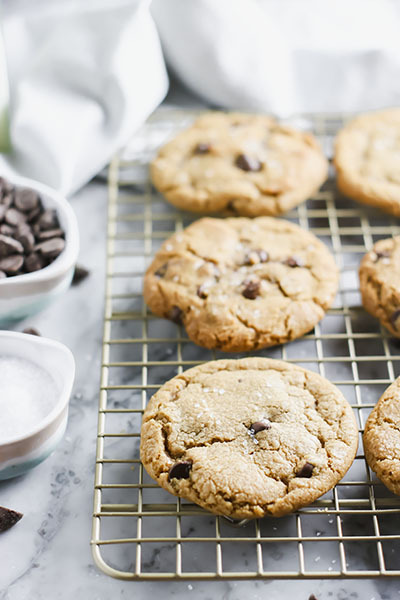 The recipe was posted on Lauren Conrad’s website (shocker, I know) but the recipe is actually from Lauren Lowstan – a baker and friend of Lauren Conrad’s. What do ya know? 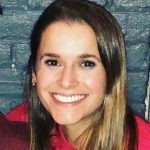 If you haven’t ever checked it out, I actually do love the content that Lauren posts on her site! She describes it as where “fashion and beauty meet crafting, cooking, and more!” What’s not to love? These cookies come out PERFECTLY soft in the center with a deliciously crisp edge and RICH vanilla flavor! Butter: This recipe calles for the same AMOUNT of butter (1 cup or 2 sticks unsalted), however, the butter in this recipe is melted and browned in a pan before it is mixed in with the other ingredients. This is also why the cookie dough has to be refrigerated before baking – the butter has to cool enough so that the dough can re-set. Sugar: This recipe calls for the same AMOUNT of total sugar (1 1/2 cups) as the original tollhouse recipe, but the proportions are different – 1 1/4 cup packed dark brown sugar and 1/4 cup granulated sugar (vs. 3/4 cup packed brown sugar and 3/4 cup granulated sugar). 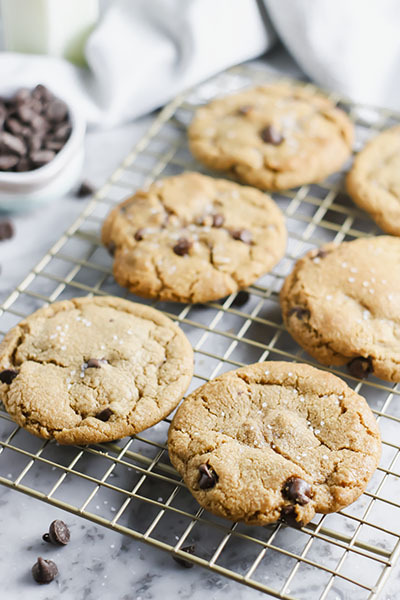 The tollhouse recipe also does not specify whether the brown sugar should be light or dark, however, Lauren’s recipe does suggest you use dark brown sugar! This will add flavor to your final cookies! Eggs: This recipe calls for 1 large egg and 1 egg yolk (vs. 2 eggs). The added yolk (without its white) will bring richness and density to your cookies. Vanilla Extract: This recipe calls for 2 tsp vanilla (vs. 1 tsp vanilla). This is honestly something that I always changed about the original tollhouse cookie recipe – I love love love vanilla extract. 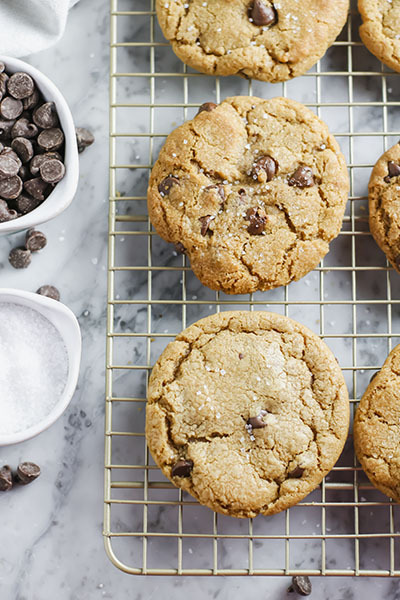 Sea Salt: This recipe calls for sea salt sprinkle on top of the cookies (vs. no sea salt sprinkle). This added step may seem unnecessary, but it seriously adds SO MUCH! Don’t skip it! 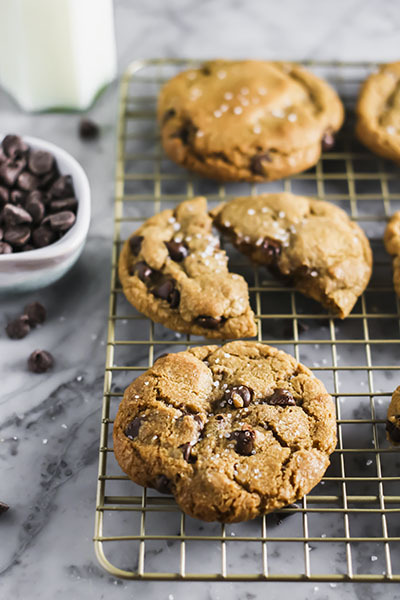 All in all – you are going to LOVE these cookies! They are PERFECT! 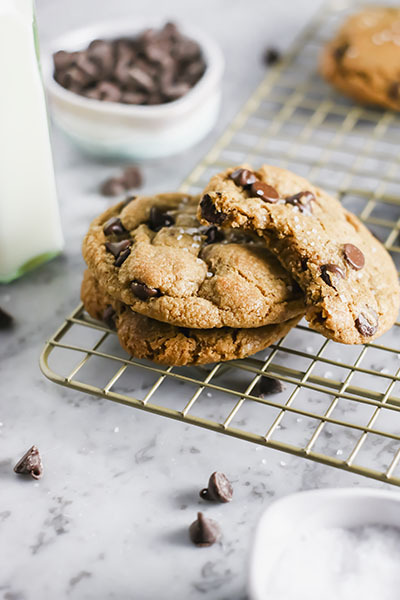 Crispy on the outside, soft on the inside - these Chocolate Chip Cookies are PERFECT! 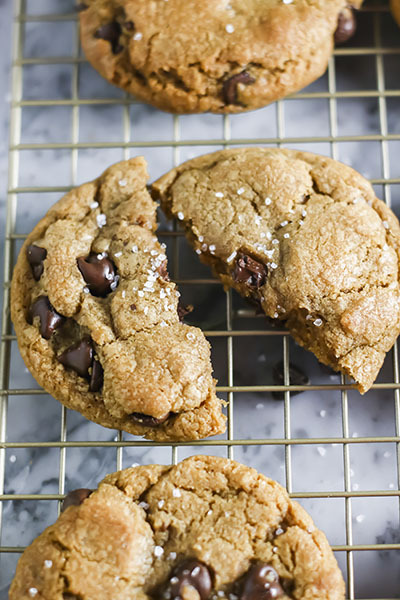 Browned butter & dark brown sugar give these cookies deliciously rich texture and flavor.